12 March 1945 was a busy day for 103 Squadron. Eleven Lancasters were detailed for a daylight bombing operation on Dortmund, taking off from Elsham Wolds 1300 -1308 h, and five Lancasters for a nightime minelaying operation in the Kattegat, taking off 1743-1745 h.
Four of the five minelaying aircraft, piloted by Flight Lieutenants J.H. Holland, A.H. Murton, C.H. Short, and A.L. Stepharnoff, were operated by their usual crews. 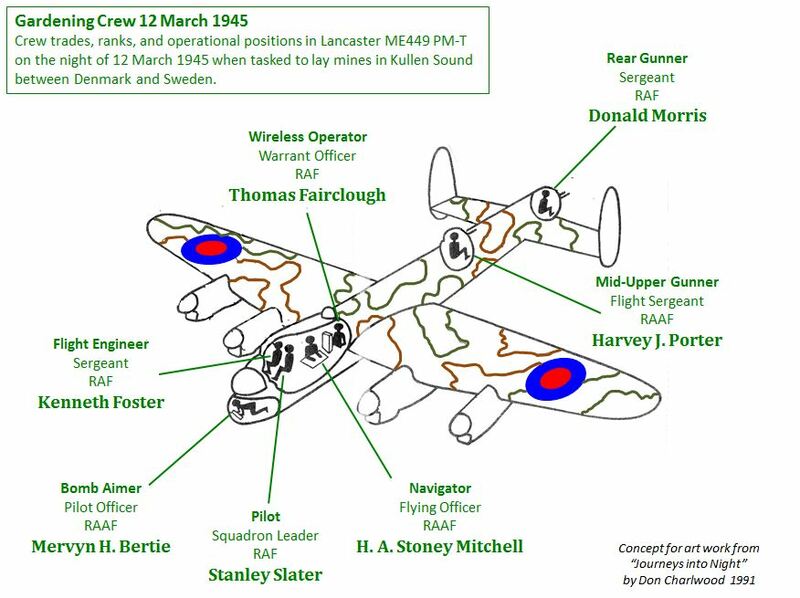 In order to crew a fifth minelaying Lancaster, Squadron Leader Stan Slater of 576 Squadron, also stationed at Elsham Wolds, was asked to put together a 7-man crew from available airmen. Ken Foster, Stoney Mitchell, Merv Bertie, and Harvey Porter of 103 Squadron had flown previous operations together, but their usual pilot Gaven Henry had broken his wrist several weeks previously and their usual wireless operator Keith McGinn and usual rear gunner John Grice had been killed on operations earlier in March 1945 (see In Memoriam). In addition to the four available airmen from Henry’s usual crew, Slater found an available gunner Donald Morris from 103 Squadron and co-opted wireless operator and former crewmate Thomas Fairclough from 550 Squadron. Slater’s crew was assigned Lancaster ME449, coded PM-T.
Of the five minelaying aircraft: Holland turned back due to equipment failure; Murton, Short, and Steffarnoff laid their mines and returned safely; Slater reached target but was shot down on the return journey as he approached the western coast of Jutland, Denmark with the loss of the mid-upper gunner and rear gunner. The two gunners, RAAF Flight Sergeant Harvey Porter and RAF Sergeant Donald Morris, were buried unceremoniously on 13 March by the German occupiers, but at war’s end the grave site was beautified and thereafter maintained by local Danes (see Englændergraven). 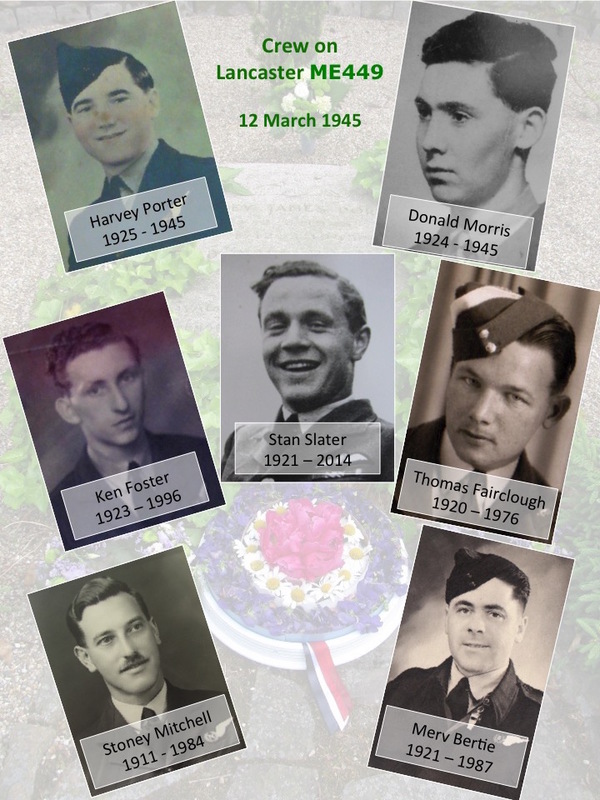 The five survivors all evaded with the aid of Danish civilians and Resistance members (see Helpers in Denmark and Evasion Story for details of Mitchell and Bertie’s experiences), reaching Sweden in late March and early April and thence on to Britain. Operational stations of the 7 crew members aboard Lancaster ME449 on 12 March 1945 according to their trade. At the time of the attack by German nightfighter Junkers Ju88 D5 + AL piloted by Eduard Schröder, Lancaster ME449 was on its homeward journey from mine-laying and Bomb Aimer Merv Bertie was assisting Navigator Stoney Mitchell at the navigator’s station.